Even if you are not an environmental activist you must admit that Sea Otters are one of the most adorable animals on the planet and should be protected. While vacationing in Seward, Alaska this past August I was lucky enough to come across this little otter and watch it for almost an hour while it was hunting, grooming and, eventually, sleeping. I saw it dive time after time, and each time it would come up with a new delicious treat. It would float on its back and gobble down whatever it brought up, sometimes using a rock to open it. I have to say it was amazing and a bit creepy to see it devour a star fish in just a few minutes. Clearly, the sea otter has some sharp teeth. After hunting, while it was grooming the otter flipped over and i could see air bubbles in each arm pit. It was so cute! I have been a life long fan of the sea otter but until this moment I had never been lucky enough to see a wild sea otter up this close. Its way better than seeing one in an aquarium. (Although I must give a shout out to the Monterey Bay Aquarium which has done so much to help sea otters.) Sea Otters are even adorable and appear to be playing when they are doing their hard work of keeping themselves buoyant. As you can see in this film they roll around and rub themselves in the cutest way. Sea Otters do not have blubber like other marine mammals so they have to keep their coats clean and filled with air to remain buoyant. They spend hours each day grooming. The otters fur is so dense that it has more hairs in a square inch than most people have on their entire head. This beautiful fur almost led to their extinction. Even though the sea otter was thought to be extinct due to hunting, they managed to survive being hunted to extinction. With the protection of the government they have increased their population. 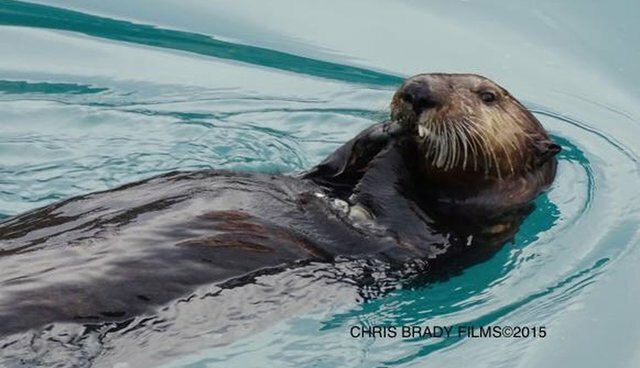 However, even now the sea otter is threatened by commercial fishing, oil spills and sometimes sharks. I have been to Alaska twice in the past two years and have only seen an otter here and an otter there. I have never seen a raft of otters in Alaska which makes me worry that their numbers are still not what they should be. The world would not be quite as bright without these adorable little animals. Lets all do our part to save the ocean and protect these beautiful creatures.